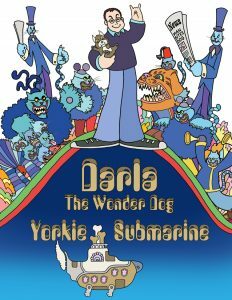 Time to save Pupperland with the release of “Yorkie Submarine.” It’s a downloadable coloring book that parodies “Yellow Submarine,” the landmark animated classic from The Beatles, celebrating it’s 50th anniversary this week. Download it for free here. The story stars Lou’s beloved yorkiepoo Darla the Wonder Dog and tells the tale of the “Idyllic Doggy Destination” of Pupperland being invaded by evil Blue Kitties. Darla escapes in the Yorkie Submarine and brings back LB to free Sgt. Pupper’s Hungry Hounds Club Band. First they travel exotic undersea locales like The Sea of Digging Holes and The Sea of Dogs Can’t See Green before batting canine-hating creatures like Crazy Cat Nippers, Dastardly Dog Catchers and The Fearsome Flying Vacuum. Brutus wrote “Yorkie Submarine” with images provided by his longtime graphic artist Alan MacBain. Alan has provided art for several Brutus-related projects thru the years as well as other music-themed work for The B-52s and Dead Schembechlers among others. FREE DOWNLOAD: Get the coloring book here. Then just download the PDF file and print it out! Be sure to share your colored versions (hand colored or computer coloring) with us on social media using the hashtag #YorkieSubmarine. Radio trade All Access covers the story here. Inside Radio with a mention here. Read the full press release here.